Lubin re-introduces two classics, L de Lubin and Nuit de Longchamp. 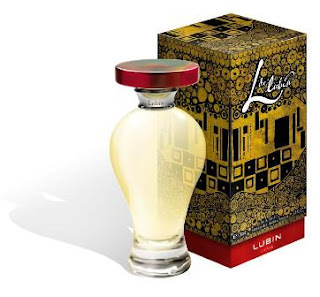 L de Lubin, "the heady scent from the seventies," is said to have been "favoured by the pop idols on the disco dance floors." It has notes of lemon, bergamot, gardenia, black pepper, ylang ylang, jasmine, rose, iris, lily, cloves, tonka bean, rosewood, tatchouli, sandalwood, heliotrope, hanilla and musk. Nuit de Longchamp "has graced the shoulders of elegant women since 1934, like a magnificent garden of white flowers blooming in the twilight." Notes: bergamot, orange blossom, nutmeg, cardamom, ylang ylang, rose, jasmine, iris, sandalwood, broom absolute, patchouli, vetiver, Tolu and Peruvian balsam, labdanum, oakmoss. Both will be available at luckyscent.com. Hmmm, the bottle for L reminds me an awful lot of Femme bottle, even the cap. Love the bottle (Femme was my first reaction as well) and the box, which reminds me (from a distance anyway) of a Gustav Klimt painting. I especially like the notes in Nuit de Longchamp. I wonder if the nutmeg is pronounced, because I adore nutmeg. Have a wonderful weekend, Marina. A 70's scent? With notes of tatchouli and hanilla could someone have sampled a little cannabis note? (Just kidding). Enjoy your break, Marina. Maybe you'll smell some interesting scents during your break! Thanks for the links. This is nice. Have you done anything on creed, my favourite? Ill visit your archive. btw: I'm reading one of your favourite books master and margarita, did you enjoy it? I would like to visit again. Scuse my boarding house reach but will someone please educate me.